Tate Gress, a senior at Harding County (SD) High School filled the position of "branding crew boss" for three years before stepping down to let another local young man, Steven Koch, step into the role for the 2013 branding season. "I'd line up all the brandings and get the times ready for everyone. Then I'd line up the crew and drive them there," said Gress. The Ludlow, South Dakota, ranch kid said that local students from seventh grade on up to seniors – and a few who are out of high school and home for college break – travel to ranches in an approximately 60 mile radius around Buffalo, SD, to provide labor for local ranchers on branding day. "Most of the time we probably average about 200-300 head of calves per day but we've done as many as 800 in a day," said Gress who explained that they usually wrestle the calves in a pen. Gress added that he tried to get "bigger kids" for the ranches that he knew would have bigger calves. Gress said the circle the crew travels seems to get bigger every year. The kids attend brandings into North Dakota where most of the operations are "rope and drag." "We go to brandings any day, not just weekends," said Gress who added that the school track coach gets a little frustrated when he takes the track kids to a branding. He said that they usually ask for $50 a day for around 200 head of calves and will raise the price a bit for bigger numbers. The high school crew expects a meal too. "We always wanted to have dinner but nobody ever complained about that," Tate said. He explained that most ranchers pay each laborer individually but sometimes he would get one check and then divvy it up amongst the crew members. The eldest of three children, Tate is learning life skills and a work ethic that would make many employers drool. "Cole Stevenson ran it before me and he taught me a lot about it. He said to make sure you get there on time and to respect people too. 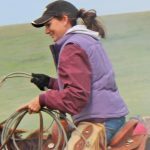 I learned about negotiating because some of the ranchers didn't like the way we did things or they'd complain if we were already booked for the day they wanted." Gress also said that he advertised the crew in the newspaper a couple of times which seemed to ramp up business. "About every night, I'd come home from school and listen to the answering machine and have to return calls and schedule a few more brandings." He said his folks were pleased that he had taken the responsibility to handle the crew for several years and knew that most of the brandings included a lot of fun along with the work. "I have been around cows and calves my whole life. When I first started doing it I was a sixth grader and I was a little timid, those calves were a lot bigger than me but I knew that I couldn't get hurt too bad." Gress added that finding a big enough crew has become an increasing challenge as kids become more busy with sports and other activities but he hopes Steven Koch, the newest crew boss will find success in securing enough students to continue the tradition. "The crew has been a great help to us," said Laurie Goehring, Buffalo, SD. "We have really appreciated them. They have been coming here for years. They are always on time. I have nothing but good things to say about them." Goehring said that the crew boss responsibilities are an honor passed down year to year to the next capable youngster who is willing and able to organize branding dates, gather a crew and ensure that the kids show up on time, work hard and respect the cattle and people at each operation. "Those brandings used to get wild, I could tell you a lot of good stories about the crew back in those days," she laughed, recalling the first bunch of local kids, led by Casey and Thad Olson, who helped her dad Paul Painter brand over 20 years ago. She and her husband Terry have also utilized the crew for many years. Casey Olson's memories of those first brandings are similar. "Paul Painter approached my dad when I was a sophomore I suppose, and wondered if he would mind if we came and branded at his place," Olson recalled. "I guess that put me and my brother Thad, a freshman at the time, in charge of it." Olson said Painter asked him to gather any other kids who would be willing to help, and this was the first time someone had put a crew of kids together that weren't necessarily their neighbors. "Of course Painters' neighbors were there to help too but he needed a few extra hands – he had a lot of cattle." "Paul Painter was one of the greatest guys I ever knew," Olson shares that he was a 'great cowboy' with a 'heck of a temper' but someone with a great sense of humor who always had time for everyone and almost always had a smile on his face. "We had a little mix of everyone, ranch kids, town kids, everyone," Olson said. "In those days even the town kids had usually spent time helping a rancher lamb or calve or worked on a shearing crew, most of them were good hands." Olson recalls that Tate Gress's dad and uncle, Dustin and Darren Gress were two of his reliable crew members. Olson said he and the rest of the crew members were paid for each branding, probably $20 or $25 per day. "A pretty good amount of money for having that much fun," and he adds that he enjoyed it so much that he would have done it for nothing. "That was a different community than home so I got to know a whole bunch of new people, some folks that were really good horse trainers who taught us a lot about horses and handling cattle, and that in itself was really valuable," said Olson. Olson explained that Painters always provided horses for the crew to ride. "That first year most of us had a good old horse to ride. Painters always had pretty good saddle horses." But the next year Paul Painter decided he'd utilize the crew a little more, and had young colts ready for each crew member to ride. "The colts probably had about 30 days riding on them," Olson recalled. He said that Joe Painter, Paul's son, would use the colts for calving to put some miles on them but most of them hadn't been roped on or been around tight quarters like a branding pen. "I learned a lot about horses from that experience," Olson laughed, adding that he hadn't roped very much until that point, but that he had roped and drug a lot of calves by his senior year. "There were a lot of pretty good wrecks," Olson remembers. "Of course being kids we were always playing tricks on each other, dragging the rope under a horse's tail to try and get someone bucked off. Those horses were pretty bullet proof when we were done, they were tired and they'd been exposed to just about everything." Olson remembers one of his friends riding a colt when the nervous horse bucked and the rider eventually bailed off. "That horse kicked out with both feet as he was falling and caught him right in the knees. We just dragged him over against the fence, threw some sacks of ice on his knees and went on with the branding," Olson said. He recalled another time when a colt ran away with Darren Gress, one of the crew members, and headed for a trailer with the door open. "Darren leaned ahead to try and get under it but the top of the trailer caught him right on the head and tore him up pretty good. It would have killed a normal person." Olson said once in a while the crew members would bring their own colt to ride, knowing it was great experience for the horse. "We all learned a lot about horses through those years." Rex Burghduff, who Olson called 'an encyclopedia of horse training tips' attended Painters' branding too and demonstrated once how to teach a stubborn horse to drag a calf and how to tie a horse down. "It seemed like there was always another natural leader ready to take the reins as the next 'crew boss.' It just got passed down to another 'A personality' each year, someone who wanted the responsibility, and it has always been a smooth transition as far as I know," said Olson, whose younger brothers, as well as his son Taz have all been members of "the crew." He said word of mouth travels quickly and local ranchers generally know who to call to get the job done.